Amnesty International is campaigning against torture as a valid method of intelligence gathering, and to prove their point, they've created a new ad campaign featuring famous people looking beat-the-heck-up, saying things completely out of character. 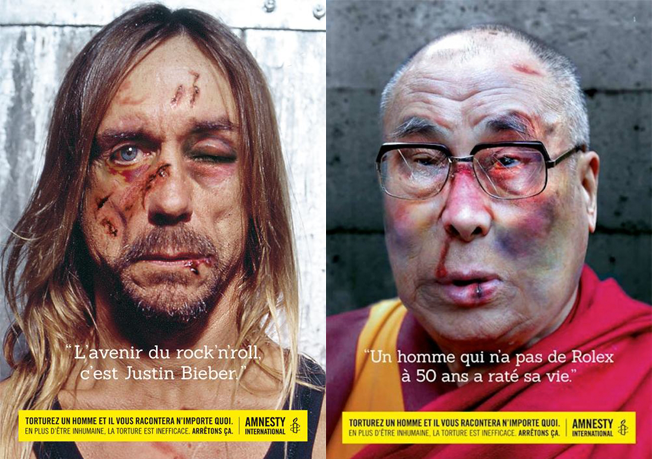 Although done without the permission of the famous faces, the point comes across brilliantly with Iggy Pop praising Justin Beiber as the future of music, and the Dalai Lama proclaiming a Rolex is the mark of success. Both end with the tagline, "Torture a man and he will tell you anything."